A thought came to mind last November 1st while visiting my husband’s late aunt and her Chinese husband. He died four years before her and she wanted to be buried beside his grave. It was sad and inspiring at the same time to know that love can conquer death. But this isn’t even the thought I had in mind. Driving through the then traffic clog roads inside the spacious Manila Memorial Park in Parañaque, I’ve noticed that mausoleums of wealthy families with their surnames etched fill one side of the park while the opposite side embraces those who can’t afford eccentric tombstones and are only laid to rest through simple graves. But the latter group aren’t technically lacking in life. In fact, most of them are professionals, business people, and even millionaires at that. Yet the fact remains that they rest in the plain section of the park accentuated only by Bermuda grass whereas their counterpart in one area boasts of expensive looking and at times even artistically decorated mausoleums with security guards or CCTV too. 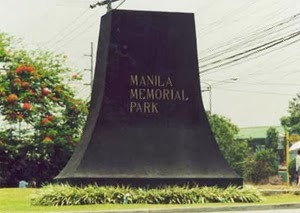 But this is already Manila Memorial Park where only those who can afford hundred thousand or even millions worth of final resting place are situated. What more if I mention Manila North or South Cemetery? Truly, even death divides the rich and poor.